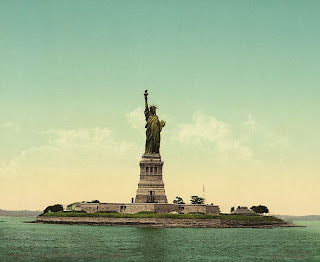 Six years after the Statue of Liberty was dedicated in 1886, the immigrant station opened on Ellis island, only a few hundred yards away.1 It was ideally positioned to greet the ships as they entered New York Harbor. Over twelve million immigrants came through this facility, making it the largest such entry point. Another reason why the statue became associated with immigration was Emma Lazarus’ sonnet “The New Colossus” which was engraved on a bronze plaque and mounted inside the pedestal in 1903. And there were also other welcoming gestures. 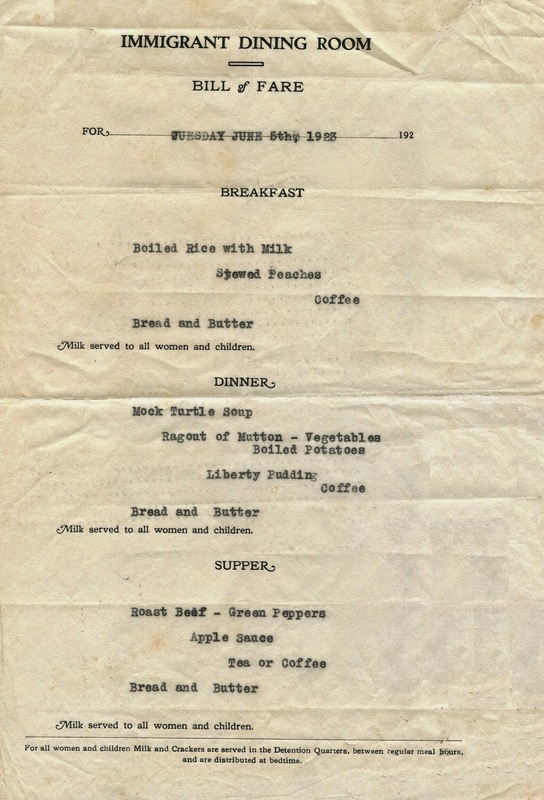 For example, the daily menu below from 1923 shows that nutritious food was provided to immigrants while they were anxiously waiting to be processed. In addition, milk was provided to women and children throughout the day at various locations. This menu features a dessert named "liberty pudding," reflecting the ideals represented by the nearby statue. 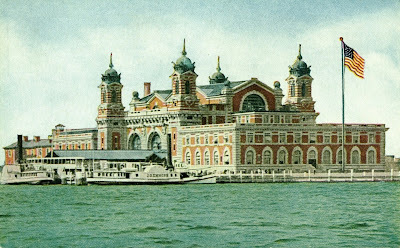 Ellis Island was mostly used as an inspection station for poor immigrants. (First and second class passengers underwent a cursory inspection by agents who boarded the ships and only had to proceed to Ellis Island if their paperwork was out of order.) Although most people spent only a few hours on the island, it was an ordeal for many of them who were still in shock from the transatlantic voyage in under-deck compartments near the rudder. Lacking adequate light and ventilation in "steerage," immigrants often needed immediate medical assistance when they arrived. Over the course of its history, about 3,500 people died on Ellis Island, including 1,400 children. Conversely, over 350 babies were born into citizenship there. The tidal wave of new arrivals during the first decade of the twentieth century caught the Bureau of Immigration by surprise. The peak came in 1907 when over a million people were processed through the station, overwhelming the facilities. 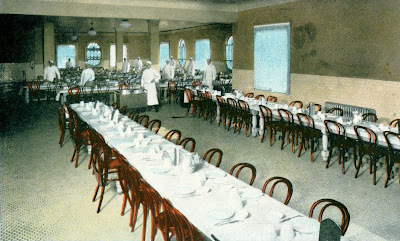 During the following year, a new, thousand-seat dining room opened and in 1911, a kosher kitchen was added to accommodate Jewish families. One of the most fascinating aspects of ephemera is that it provides unwitting evidence of our past. It would be interesting to see what types of minor historical documents will surface a hundred years from now, reflecting the immigration practices of the early twenty-first century. 1. Approximately eight million immigrants came through the New York State immigration station at Castle Garden in the Battery between 1855 until 1890, when the federal government assumed responsibility for immigration. The Barge Office at the Battery was used by the federal government until the immigration station on Ellis Island opened on January 1, 1892. The Barge Office was used again after a fire burned down the facilities on Ellis Island in June 1897. The Main Building, rebuilt in the French Renaissance style in red brick with limestone trim, opened on December 17, 1900. After 1924, Ellis Island was increasingly used to detain refugees and displaced persons. The facility closed in 1954. Today it is estimated that four out of ten Americans have at least one ancestor who came through Ellis Island.